Why Do Rhinos Have Thick Skin? 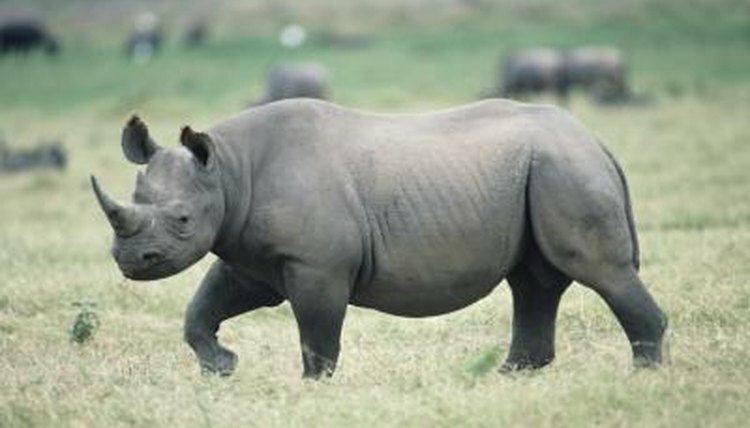 Different breeds of rhinos have different types of skin, but one thing remains generally the same: It's nice and thick. While the thick, folded skin can look like armor on some breeds, it's relatively sensitive on any rhino. Because of that sensitivity, rhinos have to be mindful of their skin and take care of it, or else it can become vulnerable, irritated and damaged. Rhinos of any breed have thick skin, but that doesn't mean that it's strong. In fact, a rhino's skin is relatively sensitive, and this is why he has so much of it. It's like wrapping yourself in a bunch of soft blankets -- just one wouldn't do much to protect you from the elements, but thick layers of them insulate you with protective padding. While the surface of a rhino's skin is vulnerable to irritation, then, its thickness helps prevent serious injuries or complications. A rhino can't afford to take his thick skin for granted -- if he doesn't take care of it, it can easily get hurt. Rhinos are particularly prone to insect bites and sunburns, so they make a habit of wallowing in the mud. Coating themselves in mud protects their skin from the harsh rays of the sun and the persistent, irritating bites of local insects. There are different breeds of rhinos, and the way that their thick layers of skin sit on their bodies changes amongst them. For example, the Indian rhinoceros is sometimes mistakenly credited with having armored plating on his body. This is simply a result of the way his thick skin hangs, though -- it is segmented around his joints to allow him to move around more easily. Along with his thick skin, a rhino's horn is his most recognizable feature -- this is neither skin nor bone, though. His horn is actually made of extremely compacted keratin, making it more like hair or nails than skin. Between his apparent "armor" and massive horn, a rhino looks like an aggressive, battle-ready beast -- in reality, though, these creatures are herbivores that only attack when they feel provoked. Does Every Giraffe Have Their Own Pattern of Spots? How Does a Rhinoceros Use Its Sense of Smell? What Mammals Have Black Skin?